On the morning of May 10, 2018 local time, Premier Li Keqiang visited the exhibition of creative products inherited from the Palace Museum themed on Let the Cultural Relics Talk in Tokyo with Prime Minister Shinzo Abe of Japan. This exhibition mainly displayed the fine cultural and creative achievements of the Palace Museum in recent years and the examples of cooperation between China and Japan in the areas of culture and creativity. The head of the Palace Museum introduced the exhibits to the leaders of the two countries. In front of the "Digital Cabinet of Curiosities" which was presented under the support of digital technology, the leaders of the two countries touched the screen together with the audience present. They had zero-distance contact with the cultural relics through high technology, and learnt about the cultural relics of the Palace Museum as well as the profoundness and extensiveness of the Chinese culture. 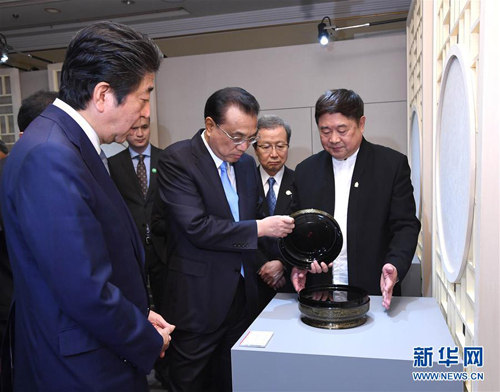 Li Keqiang and Shinzo Abe also jointly appreciated a series of creative cultural works such as bronze, lacquerware, porcelain and wood carving created by contemporary Chinese artists who drew inspiration and extracted traditional Chinese art elements from the cultural relics of the Palace Museum. The two leaders jointly watched the virtual reality video Digital Palace Museum co-produced by China and Japan and the live paintings of famous Chinese art masters. Li Keqiang said that today's exhibition provides us with the "living" cultural relics that remain sleeping for a long time and they talk with us across the history. We feel that the ancient cultural relics and traditional culture have kept up with the times, entered into the lives of the two peoples and created energy again and radiated with vitality. This reminds me that China and Japan have a long history of exchanges for more than two thousand years in which cultural exchange is an important aspect. Today, the two countries enjoy broad opportunities for cooperation in such fields as high technology. We should make the long-lasting cultural exchanges and the foundation of people-to-people friendship between the two countries glow with new vitality, inherit and carry forward the foresight, courage and wisdom of the elder generations of leaders who signed the China-Japan Treaty of Peace and Friendship, attract more people to join in the cause of friendship and cooperation between China and Japan, and inject more new impetus to China-Japan relations. Li Keqiang fully recognized cooperation between China and Japan in the field of culture and hoped that both sides will continue to intensify exchanges and cooperation, make the cultural industry a new highlight of practical cooperation between the two countries, increase mutual understanding between the two peoples, and consolidate the public opinion foundation for the long-term, healthy and stable development of China-Japan relations. Wang Yi attended the activity.